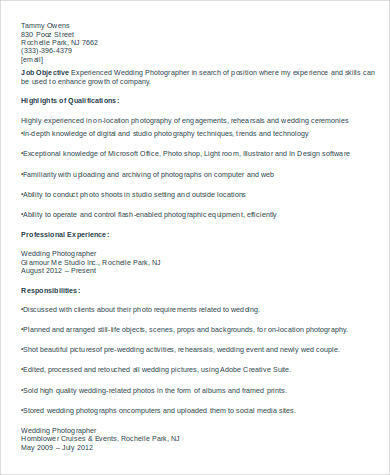 Your resume as a photographer is a snapshot of your work to date, your skills, and your expertise. It lets potential clients determine whether you are the right photographer for their projects or events. Applying for work as a photographer is just as cutthroat as with any other corporate position. In particular, your main selling points are the projects you have had thus far, and so your resume should be written, zooming into this. 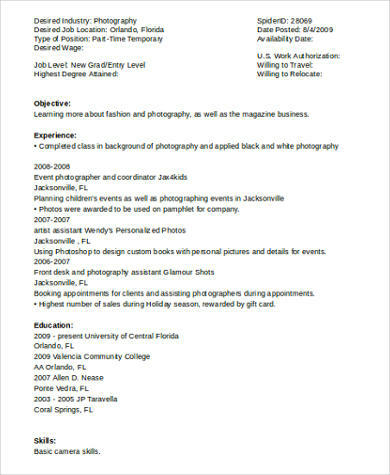 Individuals and companies look through a number of photography resumes in consideration of a specific project or event. Moreover, they tend to file these for future reference. To help you stand out and be seen in the best light, see and be guided with these Sample Resumes. 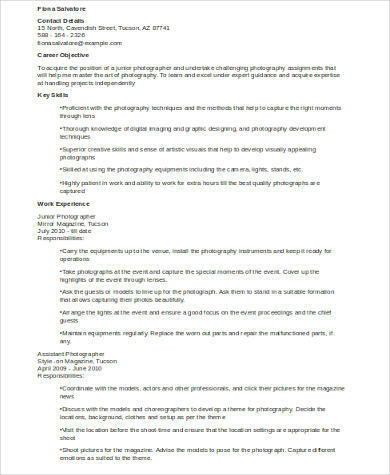 A photography resume does not follow any of the standard resume formats. That said, keep in mind that it is still a formal document, and should be written professionally. Like in these Sample Photographer Resumes, it should have contain the following details. Like all resumes, always start with a header bearing your name and your studio, if you work in one. Follow this up with your business address, professional e-mail, and your other business numbers. Thereafter, provide a section that is very much like a resume summary. It introduces your work as a photographer by indicating your biggest projects, or your years of experience. forensic photographers, among many other. Specify which one you are, or if you are a selection of any of these. This should be the bulk of your resume. There are two ways to go about this section: by date or by type of project. You can choose to start with your most recent project down to the very first, or you can start with the most note-worthy project you have had thus far. Itemize all your projects exhaustively. Start with the name of the projects, followed by their respective durations, and then describe the tasks and roles that you have performed for each one. Thereafter, specify pertinent skills such as editing. Include herein the systems or software that you work with. 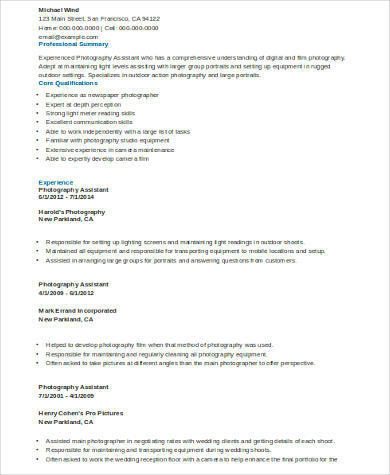 A photography resume is very rarely particular with this, unless you hold a directly related degree or certificate. If you have a major in Fine Arts or Photography, you can add this information too. You can also list noted programs or workshops you have attended here. Also list awards, nominations, exhibitions you have held, and achievements from competitions. If you are sending your resume for a specific project, consider attaching a cover letter to your resume. It should tailor-fit your skills as a photographer to what potential clients are looking for. 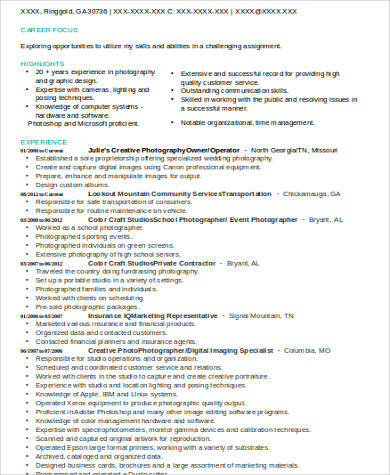 For reference, look through these Photography Cover Letters. As they say, a picture speaks a thousand words. 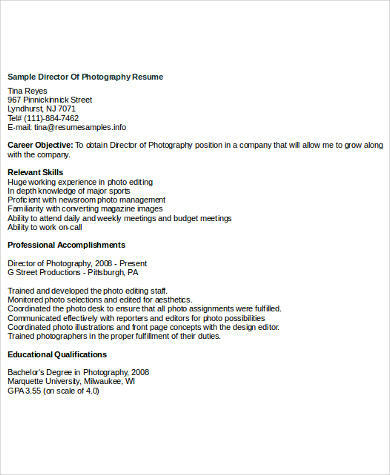 Alternatively, as a photographer, the words on your resume should attest to the pictures and the work that you are able to produce. 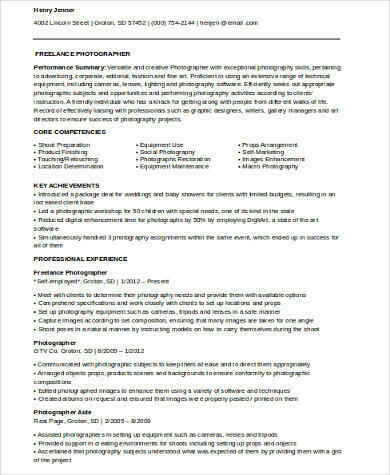 Take these Sample Photographer Resumes to guide you further.